Our destination today is Bet Guvrin, but the drive there, with stops along the way, can be half the fun! We will take the day to travel in Israel by following Routes 44 and 38 through vineyards, rolling hills and lush valleys, with kibbutzim and moshavim on both sides of the road. From Tel-Aviv or Jerusalem, exit Route 1 at the Latrun junction and follow Route 3 to the Nahshon junction and then turn left unto Route 44. After about eight kilometers note a brown sign on the right side directing you to the entrance of the Sculpture Road. Follow the well-paved path along the ridge of the President’s Forest of carob, pine and terebinth trees planted by the KKL/ JNF. Among the towering evergreens are modern sculptures created by Israeli artists, some of whom have used raw materials from the region to create their works. The area is also dotted with picnic groves, hiking trails, and short paths leading the visitor to magnificent vistas. Bicycling under the shaded canopy on a hot summer day is an especially enjoyable way to tour Israel and view the sculptures. 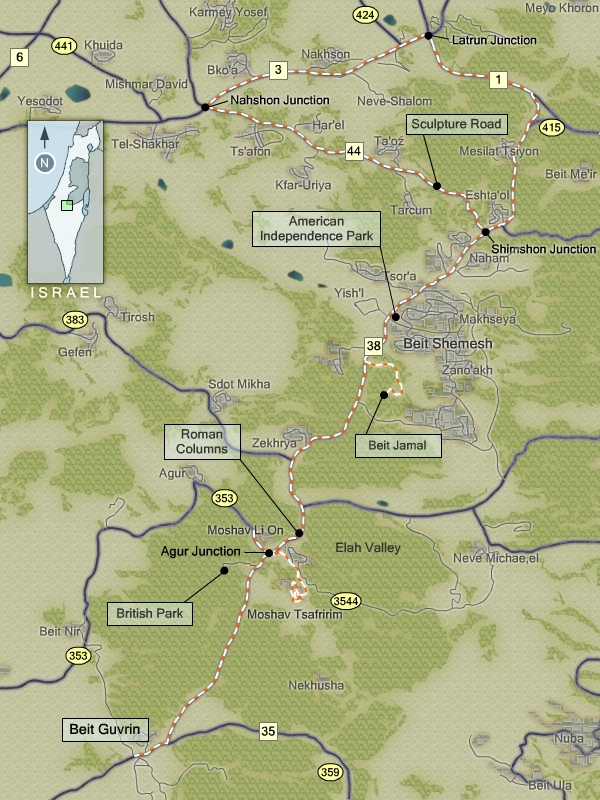 Return to Route 44 and then turn right onto Route 38 at the Shimshon junction, so named as it is in nearby Zorah that Samson was born, and in the Sorek valley was persuaded by Delilah to reveal the secret of his strength. Continue driving through the quasi-industrial town of Bet Shemesh, to American Independence Park, following the brown signs in the direction of the Sorek stalactite cave. The well-paved five-mile drive up U.S. Vice President Hubert Humphrey Parkway is one of the most beautiful attractions in Israel and provides the visitor with a stunning view of the Sorek valley below, as well as hills, valleys and the sea far into the distance. Near the summit one can reflect on the sculpture memorializing the crew of the Challenger spacecraft. Then, before turning around to proceed down the hill, stop to admire a stone topographical map of Israel, as well as the memorial to Israel’s first astronaut, Ilan Ramon who perished upon the disintegration of the Columbia spacecraft.If you want to visit the cave and the surrounding area, check out my blog Sorek Stalactite cave. 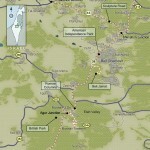 Follow Route 38 from Bet Shemesh in the direction of Kiryat Gat, driving through the Elah valley where David slew Goliath. Here, try to imagine the battle scene as described in Samuel 1, ch.17, with Saul and the men of Israel massing on one side of the valley, the Philistines stationed on the opposite hillside, with the ravine between them. Today, the Elah valley is home to numerous galleries and workshops located in kibbutzim and moshavim along Route 38. A guide to these shops as well as local events can be obtained at any of the galleries. In Moshav Sirigim Li-On one can purchase colorful leather shoes manufactured by Einat Kedmi at her home workshop. Einat studied and worked in Switzerland for many years and brought her experience back to Israel in 1990. The foam rubber soles, threads, and leathers are all imported to create custom made shoes so soft and light that you may forget that you are wearing them. To make an appointment with Einat call 02-9990357. The Kakadu showroom and factory can be found further down the road at Moshav Zafririm. Owners Aahron and Reut Shahar are often seen at their factory designing and painting their collections of furniture, wooden carpets, and decorative tableware, or at their Tel-Aviv store on Dizengoff St. At the moshav, the Shahars run painting workshops for visiting families and also lecture larger groups on topics related to design and color techniques. Kakadu can be reached by calling 02-9998921. While driving through the Elah valley, note on your right the entrance to British Park, which warrants a short detour to view the area from the park’s observation posts. As you reach Route 35, turn right toward Bet Guvrin, as proceeding left would lead you to Hebron. Rather than immediately entering the national park, leave the car at the gas station to pick up some drinks and other packaged foods, before a short walk to the adjacent amphitheater. This may also be a good time to slip on some good walking shoes. The amphitheater is one of the most beautifully preserved Roman structures in Israel and is a must-see stop on your Israel tour. It was originally constructed for the entertainment of the Roman troops that were garrisoned in the area after the suppression of the Bar Kokhba revolt in 132-135 CE. Visitors can easily walk through the magnificent four-vaulted vomitoria, which led spectators to the seating areas. Though the seats are still visible, unfortunately the marble has been plundered. A circular subterranean complex housed the wild beasts, while in another room archaeologists excavated many oil lamps used by gladiators in the performance of rituals and libations before and after combat with the animals. The amphitheater was in use for about 200 years, and may have been abandoned after the earthquake of 363, which destroyed much of the city of Bet Guvrin. In the early Byzantine period the amphitheater became a marketplace, while later, in Medieval times, it was used as a stable and storeroom. In the 12th century, Crusaders built a fortress on top of the amphitheater, and some remains of its adjacent church can still be explored today. Returning to your car, cross the road to enter the Bet Guvrin National Park, and request a brochure with a detailed map of driving, parking and hiking instructions. The most important sites to visit at the park are the bell caves, the columbarium, the Sidonian tombs and the olive oil plant. 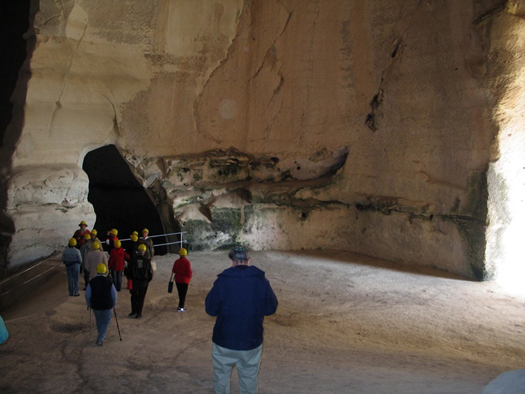 The huge bell caves, which were excavated during the 7th to 10th centuries, are most impressive for their immense size, and are today used by Israelis for wedding ceremonies and concert performances. 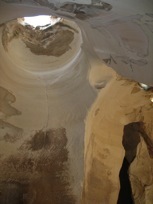 The area was originally dotted with some 800 caves, which were easily hewn from the deep layers of soft limestone that is unique to the area. In fact, the quarried limestone was sometimes used for building projects on the coastal plain, and some of these can still be identified today as coming from Bet Guvrin. Each of the bell caves has a chimney type hole on the top, used as an entry point for the workmen who carved the limestone from inside the perimeter into blocks removed by ropes. As you continue exploring the National Park, note it’s highest point, Tel Maresha. Maresha is referenced in Chronicles 2, ch.11, as one of the cities in Judea fortified by Rehoboam against the invading Persians. This conquest saw the Edomites settle in the area, and in the 4th century BCE, Sidonians, the Greeks, as well as some Jews fleeing Jerusalem came to Maresha. Later, the Hasmonean King, John Hyrcanus 1, conquered Maresha and converted its citizens to Judaism. Josephus writes of Bet Guvrin as having been conquered by the Roman General Vespasian, though a community of Jews continued to live in the city until the end of the Bar Kochba revolt in 135. Ascend the tel to the southeast observation point for an interesting view of the surrounding Hebron Mountains, and then explore the excavated shops, homes and tower. From the tel it’s a short walk to several caves, of which the pigeon coop cave or columbarium merits a longer visit. It’s beauty is defined by its shape, a double cross. Within the cave, 2000 niches for the breeding of doves were carved into the soft limestone walls during the 3d century BCE. While biblical scholars believe that doves were mainly used for sacrificial purposes during religious ceremonies, here most of the pigeons were raised for their meat, while their droppings were used to fertilize the surrounding olive groves. The importance of this olive crop to the local economy is attested to by the fact that 22 subterranean olive presses have to date been found in the Bet Guvrin area, of which the crushing and oil extraction plant in cave number 5 is an excellent example. Also, before returning to your car at Parking area A, you may wish to cross the road to examine the interesting reproduction of the oil press and crushing mill. From there it’s a short walk or drive to the Apollophanes or Sidonian tombs at the edge of the biblical and Hellenistic city of Maresha. The Sidoneans left their mark at Maresha by excavating a series of unique burial caves, interring their deceased in rows of niches designed to form a triangle above each crypt. The paintings and inscriptions in the Sidonean caves have been beautifully restored and vividly bring to life the beliefs and customs, as well as the social hierarchy of this 3rd-2nd century community. From there, it’s a short walk through an olive grove and picnic area to a gift and snack shop. At the conclusion of your visit, depart the main park entrance and return to Route 35 and 38 traveling toward Bet Shemesh. Immediately after the Agur junction with Route 353, note on the left side of the road a small hill with a group of evergreens surrounding four Roman columns, which served as mile markers for one of the five roads that led to Bet Guvrin. Before approaching Bet Shemesh, look for a sign directing you to turn right up a narrow paved road to the hilltop Monastery of Beit Jamal, which was established in 1881 by Cessian monks. Wander through the gardens to the rear of the Monastery, where a 5th century Byzantine church was excavated in 1916. The discovered floor mosaics have been beautifully preserved and are now prominently displayed on the outside of the rebuilt church which is dedicated to St. Stephen. The site is especially meaningful for visitors participating in holyland travel as the frescoes and paintings inside the church beautifully illustrate St. Stephen’s life and martyrdom. Note especially the ornate wooden ceiling, the painting of the 12 Apostles and the 4 stained glass windows depicting important moments in the life of Christ. The arched entranceway into the Monastery houses a wine shop where tastings can be had and purchases made of the Cessian wines whose vineyards are in the West Bank. Inside the building you can view an interesting video and then proceed up the stairs to visit the chapel and meeting rooms. A walk through the olive grove and parking lot will lead the visitor to a shop, where beautiful pottery handcrafted by the resident Sisters can be purchased. Immediately adjacent thereto, a small store sells locally made condiments and sweets for your ride back on Route 38 to Jerusalem or Tel Aviv. For a schedule of Saturday and holiday concerts at Beit Jamal you can call 054 474 4799. Travel in Israel is relatively easy, but feel free to click on the map below to help you with your itinerary and directions.